A few weeks ago I received a summons for jury duty. Now, some people would think this is a wonderful thing. They would enjoy being on a jury and fulfilling their civic duty. So as soon as I got the summons, I immediately went to work using the Law of Attraction to get out of jury duty. Now, I didn't want to just not be appointed to a jury, I wanted to get out of going to the courthouse altogether. I put that post-it note on the jury summons and put the summons out of sight. Why out of sight? Well, every time I looked at it, I didn't feel good. 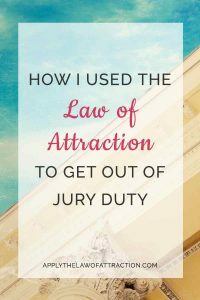 It reminded me how much I wanted to get out of jury duty, and you know how important vibration is for the law of attraction! Feeling bad is exactly what I didn't want to happen. It would undo all my work and guarantee I not only had to appear at the courthouse, but would end up on a jury! So I put that jury summons somewhere I couldn't see it at all. Every time the thought of jury duty came into my mind, my mind was focused on the outcome I wanted to attract. Any time I thought about going to the courthouse, I immediately changed the thought to one where I would imagine myself calling the night before for reporting instructions and hearing the voice on the system tell me that my appearance was cancelled. Any time I thought about going through the jury selection process, I again changed the thought to one of being told that my appearance was cancelled. And each time I thought about jury duty, I expanded my heart energy and experienced oneness with the outcome I desired as if it had already happened. I didn't worry about limiting beliefs. I didn't worry about whether the Law of Attraction would work. I didn't worry about what I would do if my desire didn't manifest. I focused solely on what I wanted – my appearance to be cancelled – and I made sure that I only allowed myself to feel good and to think good thoughts about my jury summons. I didn't spend days or even hours trying to make the Law of Attraction work. It was just a few seconds here and there whenever it came into my mind. Days went by without me even thinking about it. My biggest concern was that I might forget to call in because I was so at one with my jury appearance being cancelled. Exactly what I wanted! My appearance was cancelled! I used the Law of Attraction to get out of jury duty. You can too! Just follow the steps above. And if you want to use the Law of Attraction to serve on a jury, just do what I did, but change everything to seeing yourself serving on a jury. Love this! Will try it if I get a summons for jury duty! Can a person who is manifesting a relationship add this onto the other manifesting techniques from your book? Does anyone know how this method will work on eliminating hot flashes? I have had them for over 10 years and declare that this will be the last year that I would be dealing with them. How would I word it? I am saying affirmations now and I got them down to every hour as opposed to the usual every 5-10 minutes…which I am grateful for, but I want them gone ASAP! Just like that ticket Lol! (no joke though-they are terrible)!